Christmas has come early at Ladbrokes Casino and they want to offer you 50 FREE Spins worth £15 to play on their exciting festive game Santa’s Wild Ride. No deposit is needed! Find here how to join this promotion! That's it! Your account will be credited with 50 FREE SPINS on Santa’s Wild Ride within 48 hours of your claim being submitted. It’s as simple as that! Did You Know: By claiming our 50 Free Spins offer you are also entitled to enter our Christmas Prize Drawto win a trip to Las Vegas. Please Note: Any winnings from your free spins will be paid into your bonus balance and cannot be withdrawn until the Turnover requirements are met. Don't forget you will get also £25 free chips (no deposit bonus) if you register a new account through our banners or links! The promotion will begin at 00.01 GMT on Wednesday 14th November 2012 and ends at 23:59 GMT on Thursday 20th December 2012. 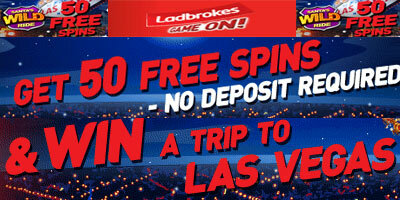 This offer is only open to new customers who do not have an account with Ladbrokes.com or customers who already have a Ladbrokes account but have never played Casino before. This offer is only open to customers residing in the UK. This promotion is only available to customers that have completed and submitted the claim form. Providing all criteria are met the free spins will be paid within 48 hours and a confirmation email will be sent to all qualifying players. The free spins will expire if they are not used within 7 days of them being credited. Playing as a guest user on Free Play mode does not contribute to eligibility for any offer. Any winnings from your free spins will be credited to your bonus balance where turnover requirements apply (x30). Click here for further details. Only one free spins offer per customer is available, per household, per shared computer and shared IP address. The 50 free spins can only be used on Santa’s Wild Ride. The free spins will be to the value of £15, made up of 50 spins, played with 1 coin to a value of 0.01, across 30 pay lines. Each spin will be to the value of £0.30. The free spins will be available on our Instant Casino only. Full Terms and conditions of Ladbrokes website apply. Ladbrokes Casino reserves the right to limit the eligibility of a customer to participate in a promotion or exclude players from a promotion if there is reason to believe any player is abusing a promotion. "Ladbrokes Casino: get 50 free spins on Santa's Wild Ride and win a trip to Las Vegas"